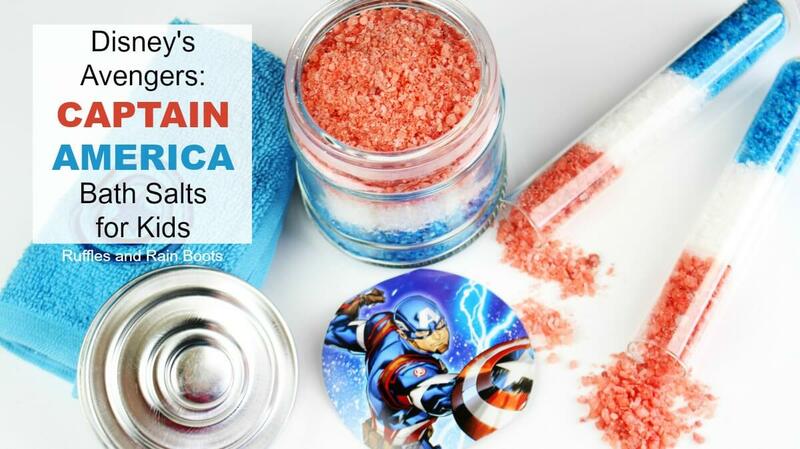 These Captain America and Avengers bath salts will please even the most die-hard Avengers fan! They are so quick to come together and when paired with these Avengers bath bombs, you’re going to be the favorite person in their lives! 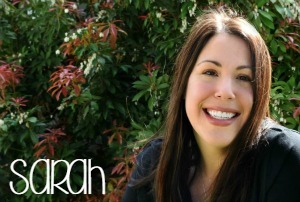 I’ll walk you step-by-step through this easy DIY bath project. Use a green colorant for The Hulk. You’ll get the deepest green if you use this powder. Thor, my favorite and I’ll give you one guess as to why would be great in red and silver (use this powder). Make all the bath salts red for Iron Man fans (add a little gold mica powder). Ant-Man would also be red, but just a little darker or deeper shade. 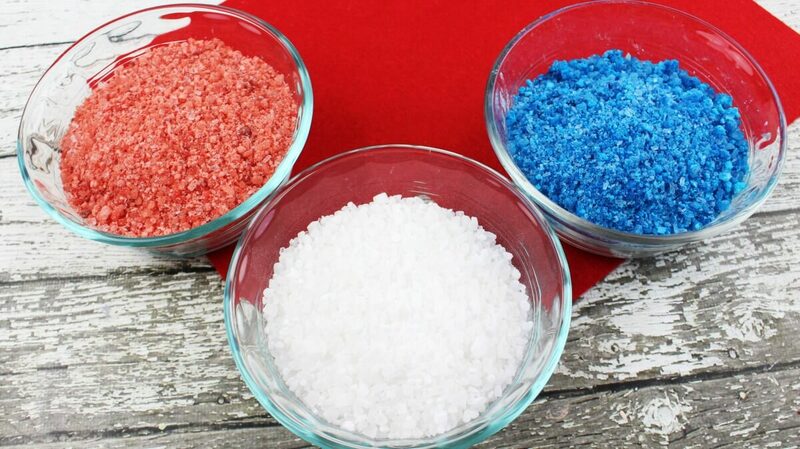 Spiderman fans would love to get these Avengers bath salts in blue and red. First, combine your dry ingredients and whisk them together. Whisking is literally the most relaxing activity I do in the kitchen. 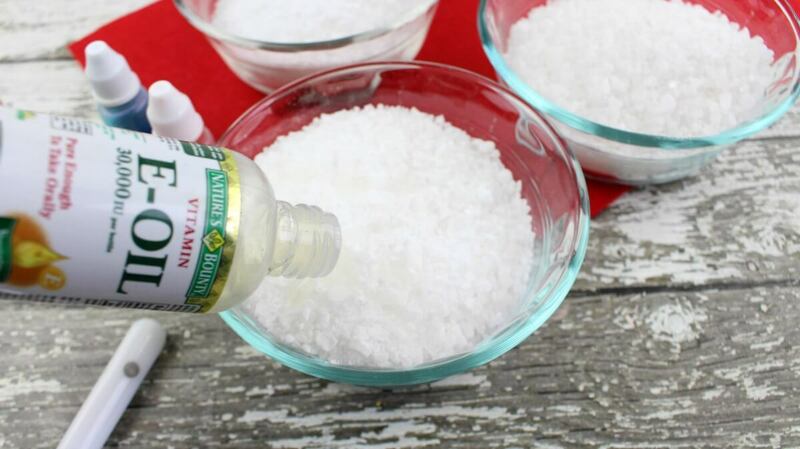 Add the vitamin E oil and any fragrance (between 10 and 20 for a batch this size). Next up, divide the mix into three equal amounts and set aside one to keep white. For the other two, mix in the colorants in a bowl or a zipper-sealed bag (easy peasy and great if the kids are making these). Now is the most fun part of the entire project! 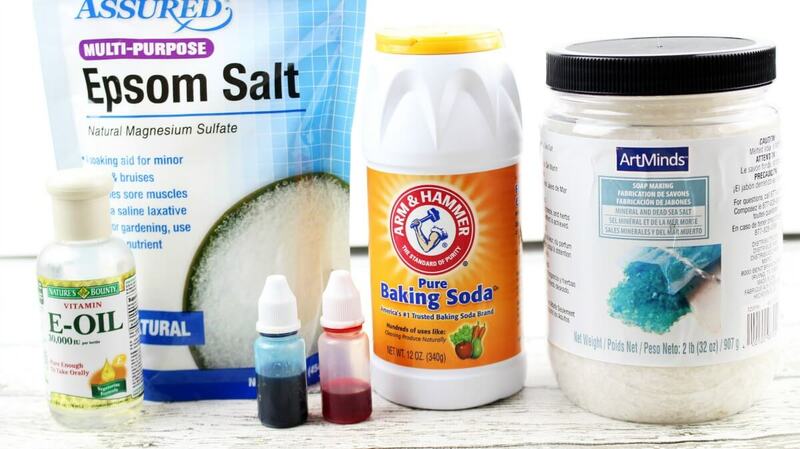 Layer the bath salts in your container. GET THESE TEST TUBES, Y’ALL – kids absolutely LOVE dumping them into the bath. And I like that we can reuse them for all kinds of bath and science projects. 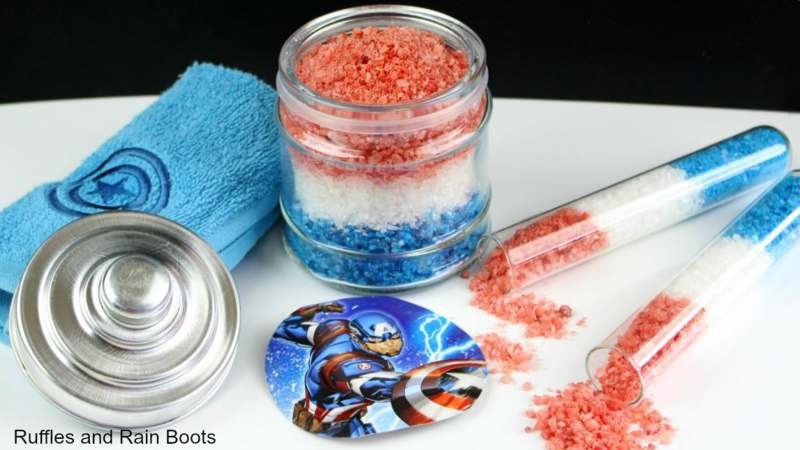 These Captain America and Avengers bath salts will please even the most die-hard Avengers fan! 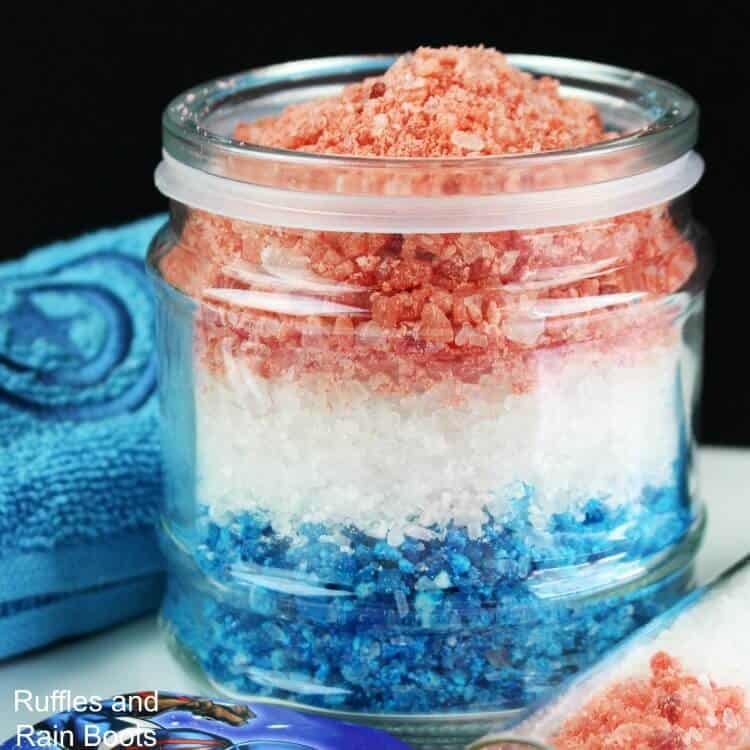 To set up the most amazing Avengers bath for your superhero or Marvel Avengers fan, whip up a quick batch of Captain America (or other Marvel Avengers hero) bath salts and some great Avengers bath bombs! Bath bombs make ALL baths and showers more fun for kids (and some of us adults). 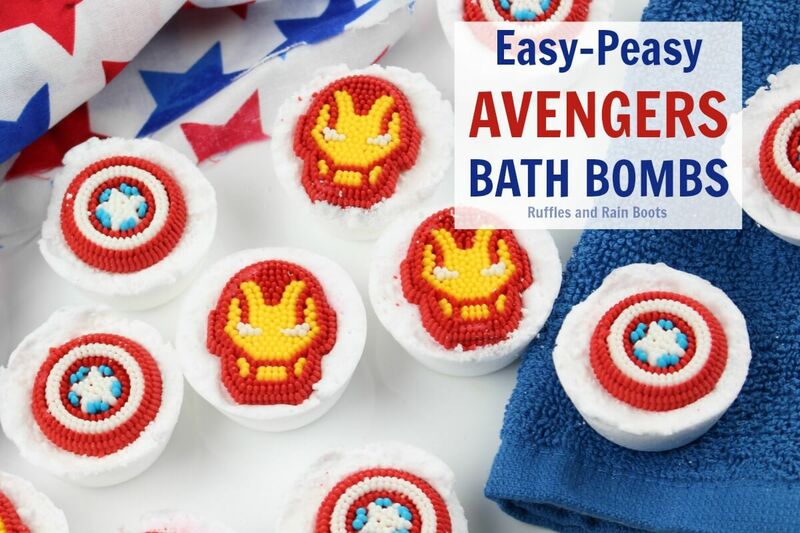 These Avengers bath bombs are so easy to make and only take about 20-minutes of hands-on assembly. Who is the Avengers fan in your house? I can safely say that my husband and I coordinate date nights around the opening weekends of all the Disney Avengers movies. If you liked this fun Avengers craft, would you please share it on Facebook or pin it to your favorite DIY crafts board on Pinterest? Your share are how we grow and we are sincerely grateful.